blog year 1 - JP loves LIFE! On October 1, 2009, I posted my first blog post — it was a pretty simple message with a short video about comparisons of dryland and irrigated cotton from a turnrow. Alot has changed in the last year. An easy change to reference if that Texas cotton farmers got a great year of moisture and you can’t see such dramatic differences in the field. But in terms of blogging, I’m not sure where to start really because there have been enormous changes! Starting a blog I wasn’t really sure how I’d find my voice. I was worried that what I had to say wouldn’t be that interesting to other folks, that I wouldn’t really have the time to do it, that other people are far better suited to talk about agriculture, etc. Suffice it to say, I wasn’t sure I’d make it through the first year. Now, I find myself a year later wondering what I would have done with all these thoughts in the past year that I captured here and shared with others. I think of the discussions I’ve had with people who found something new to them when they read my blog. And I think of the incredible community of bloggers I’ve found, a community that seems to be expanding almost daily! I have so many reasons to be thankful when it comes to blogging for the past year and the vast majority of those are people. Thank you for everything! A year has been quite a commitment for me and whereas I started posting something sporadically, I am now a blogging regular (some would say addict – LOL). I have moved from a point of thinking I need to save up til a great idea comes to me, to routinely looking for ideas and acting on them before they disappear. From an introspection and evaluation standpoint, I wanted to take some time and look at what I have been able to accomplish. And while I’ve played around at a few things here, taking stock in what people like to read, etc. So I looked through the data to see what stood out. Speechless or Ready to Rant? I Chose The Middle Ground – This is a blog post I wrote for the greatest part while on a plane after a conversation where a fellow passenger & I started chatting and things turned to what we do. When I said who I worked for (Monsanto Twitter, Blog & Website) the friendly banter turned and the word “evil” was thrown out. The conversation was an interesting one… wish I’d had a digital recorder, but I started putting it in my Blackberry. It became my highest ranked blog post in January… not sure anything will ever topple it either which is fine too. Paying Tribute to “Just a Farmer, Plain and Simple” and Just a Farmer, Plain and Simple – These two posts were put together quickly with the first honoring a good friend’s (Mike Haley) granddad as he passed. The poem by Billy Collier seems legendary in the ag community. Glad to learn about it and the greatest generation and their efforts on the farm and in our families. Top 10 Twitter Lists To Follow on Agriculture – A really recent blog post just pointing to some of the Twitter lists I find most useful. I’m still surprised it has resonated so well with other folks online so quickly. Wait, I should say I’m still amazed it has resonated so well. The 2009 Blizzard Through the Tweets of Two Farmers – Over the Christmas & New Year’s holidays I had the chance to capture some of the tweets of two farmers – Mark McHargue & Debbie Borg – in Nebraska taking care of their livestock through the worst storm I can remember. This summer I started a weekly series of food polls, several made the list of top posts and I count them together. Got a Farm Blog? #AgBlog it – An idea I had and threw out there to help those of us writing ag-related blog posts spread stories of what happens on farms. I have to admit I’m proud how this has caught on & helps us find original content to share. My Top 10 Farm-Related Hashtags in 2009 – I needed something else over the holidays! This was quick & easy. I will be updating it in the near future cause it seems useful. FarmVille vs. Real Farms [INFOGRAPHIC] – Another really recent post & this one was spurred by the media. I still can’t get over the FarmVille craze but the comparisons of numbers from it to farmers leaves me perplexed. Average Age of Bloggers Covering Ag & Farm Topics – I love getting information from the source. We have a great group of bloggers out here and at various ages. I’m also impressed by the number of people who have been doing it longer than me. Lots of expertise & information out here in our ranks. Twitter User of the Year Nominees Includes #AgChat Founder – This was one of a series of posts about the campaign a few people mounted to get agriculture more notice in social media. We thought the weekly #agchat convo was a great example & mounted a campaign to get visibility. In the process, some farmers who participated in the weekly chat formulated the ideas which gave birth to the AgChat Foundation. What an incredible time! 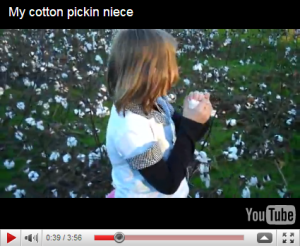 Cotton Pickin’ Halloween – Last Halloween was obviously very early in my blog. I spent the day with my niece and as we went to a friend’s for a hayride and trick or treatin’, we stopped along the highway to let her pick a little cotton. It was her first time to handpick (at least as far as she remembered) and the enthusiasm with which she greeted it still gets me. Yes, I was too excited to do too well with the video camera, but you can see the thirst for knowledge and excitement of being in a cotton field! It Was the Third of June, Another Sleepy Dusty Delta Day — I love the song and always have. After living in the Mississippi Delta for more than a decade, the image is forever in my head. Seems to be the same for a lot of other folks too as it’s done well. An Anniversary Hallmark Doesn’t Have a Card For — Marking one year since I’d gotten to know a farmer based on a simple tweet he sent. He’s family now and contributed to this blog post. So good to see him putting his thoughts in his own blog too now! Thanks Darin for everything! Three Days in Another World — I didn’t know much of anything about livestock a year ago. Lots of folks have taken time to walk through things with me. This was my first chance to get hand’s on experience at a livestock show. Wow, I learned a lot from some great folks. I need to do more of this! How many kinds of rice do you know?— I’m a huge fan of travel and food cultures! This was some of both. A vacation to The Philippines included some ag & farm related info and after getting home I posted some of it. Rice is a crop I’ve worked before and having family and friends who’s cultures are centered on that grain as much as my family is on wheat & hot rolls strikes me. A New Thanksgiving Tradition in the Making? #ThankAFarmer — Thanksgiving is our family’s major holiday every other year. In my lifetime we have gone from having nobody at Thanksgiving connected to agriculture or the food we eat to a few of us having daily connections! That’s real change! And what’s incredible is my family runs the gamut. Yes, we do thank the farmers who provide the food on Thanksgiving and most days, we all should do it daily! My blog is a personal outlet for me. I love that other people like it & want to read it. On the other hand, I know that I could get a lot more traffic writing sensational posts in confrontational tones. It’s not me nor is it what I want to do frequently. When those things come to me, I also know I don’t have to shy away. There are things that I am able to uniquely experience… this gives me a way to share that. I’m not sure what the next year will bring but I hope I continue the positive trajectory of both learning and sharing information about agriculture. As I sign off, if you read this blog post or have ever read any of the others, thank you very much. Whether you commented, clicked on a rating, and whether I have a clue you are out there, you are part of the online community that makes me feel so at home. Thanks and please share any and all ideas that you have. I appreciate more than anything that this has been very much a conversation with ideas and knowledge coming from all corners.